This week’s podcast comes from a blog I posted up on the AirMagnet AirWise Community web site a while back. There is also a link to a PDF copy of this document if you’d like. Maslow’s Maxim, or as some people know it, Maslow’s Hammer, has been stated and paraphrased many times. It has become so widely accepted that the concept has become almost fabled. 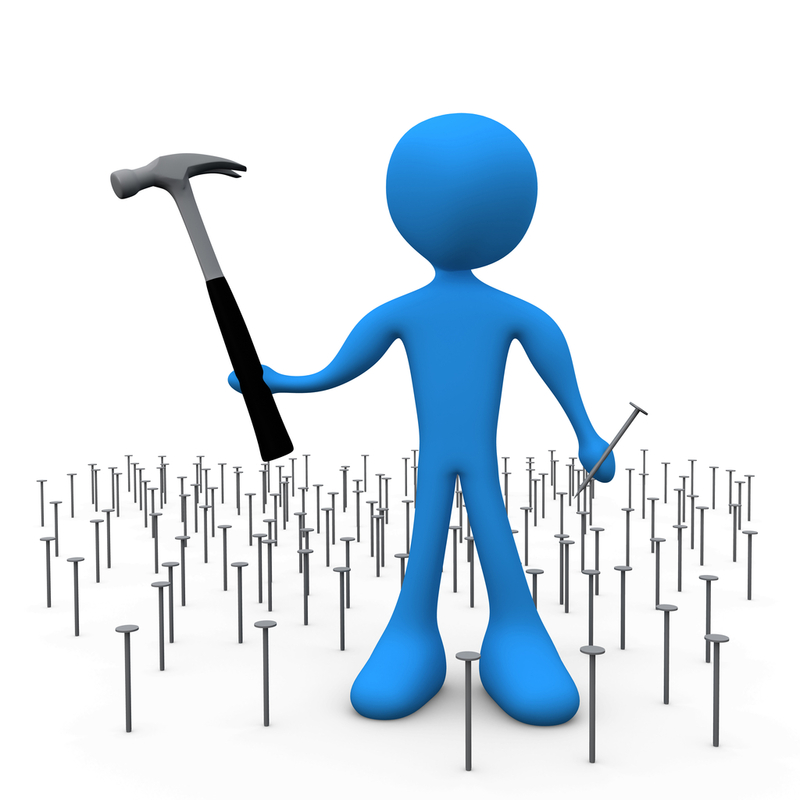 Royalty-free 3d generated business clipart picture graphic of an overwhelmed blue person holding a hammer and nail while standing in a patch of many nails. The concept is thus: individuals who are incomplete in their knowledge or training of solutions propose the same type of solution to every problem they encounter. They opt for the more familiar solution to one that may be more effective yet with which they are unskilled. Here is where many of us involved in Wireless LAN technologies find ourselves. I’ve seen this in myself. I’ve been using and teaching others to use AirMagnet products for many years. A large chunk of nearly every day is spent using AirMagnet tools. I thought I was pretty good at them. Then the other day on a consulting gig, I had a client looking over my shoulder and asked why I did something a certain way. I thought this was a good teaching moment, and so I slowed down, and started to explain the purpose behind my actions. When I was interrupted, and asked not about what I was doing, but why was I not using the ‘easy way’ in the software interface. With a simple click, the new user showed the master a much simpler process. I was a bit dumb-founded for a minute. I’d spent countless hours doing something an old, slow way. Why you ask? Because that’s just the way I’d always done it. Sometimes we just need to see things in a new light, back up and see things with a different set of eyes to realize there might be a new way, or new idea to accomplish something. Now back to the Hammer and all those nails. In the Wireless LAN industry we go about our daily lives designing, maintaining, and troubleshooting a wide set of WLAN equipment. Usually using the same old tools and techniques we learned from our mentors. Doing things the same way, just because that was the way we did them in the past. I taught and consulted with my clients for many years they didn’t need to have a spectrum analyzer, why? Because they were expensive, and quite difficult to understand. And who needed a Spectrum Analyzer anyway when you don’t get paid to deliver dB’s (RSSI) but instead we get paid for delivering Bits (frames of data). Then along comes AirMagnet’s Spectrum Expert, and we all learned quite a bit about the RF world around us. Regular Wi-Fi NICs just can not ‘see’ the ambient non-modulated RF. In fact, sometimes they’ll report ‘noise’ when there is very little, or the reverse; they’ll report no ‘noise’ when there is way too much ambient non-modulated RF. Today we have AirMagnet’s Cognio-based Spectrum Expert, and additionally AirMagnet’s USB-Based Spectrum XT, and just released AirMagnet’s AirMedic USB to help us ‘see’ the ambient real-world RF environment. We need to use the appropriate tool for the job. My father once tried to change the oil in my new Plymouth Horizon. He had the same type of car, but mine was a bit newer and had a different Volkswagen engine that needed a special oil filter wrench. I saw him drive my car off the blocks and down the street dripping oil down the road. Upon his return an hour later, I learned he’d pierced the oil filter trying to use his “old reliable tool” that had worked for years. The nice folks at the Oil Lube place at the bottom of the hill by his house were kind enough to use the correct tool for the job and fix his mistakes. What tools are you still using to design, maintain, and troubleshoot your Wireless LANs? Are you still doing the old AP-on-a-stick method of designing only for coverage? Are you still trying to estimate cell overlap with old-fashioned percentage methods? Are you still using NetStumbler for Rogue AP discovery? Are you still using Wi-Fi NICs to gauge RF Noise? What about SNR? Are you still trying to understand Wi-Fi by looking inside the IP-layer payload? Are you still using an old laptop with PCMCIA slots just so your old tools work? What is your Wireless LAN hammer? Isn’t it about time check your toolbox and make sure you have the correct tools for your job of designing, maintaining and troubleshooting your Wireless LAN?